As we start the new school year, we want to remind you of systems we have in place for you to participate in setting goals for your child and communicating concerns. The upcoming Meet-and-Greets start a conversation about expectations and classroom routines. Please use the time to meet fellow parents, communicate concerns and coordinate with the teachers on common goals for the children. Please also feel free to schedule Parent-Teacher Conferences with your child’s teachers, either in person or by phone, at any time to discuss concerns you have. 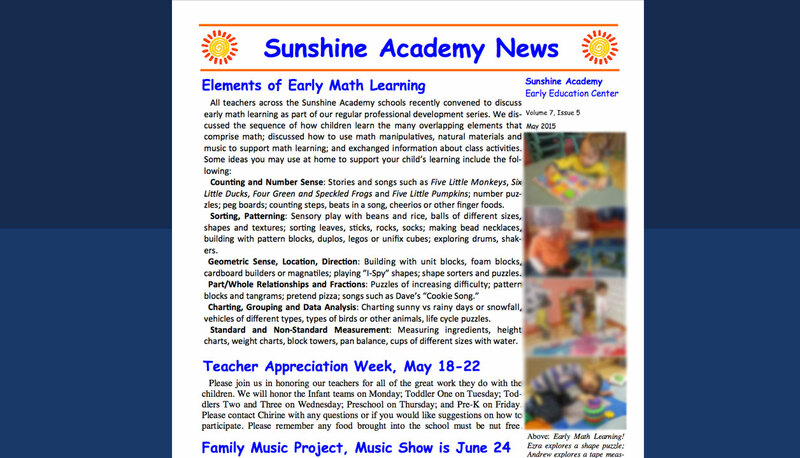 In your mailboxes every day, you will receive a Daily Sheet with information about your child’s activities and accomplishments that day. Please use the information to initiate a conversation with your child and his or her teachers about class activities. Should you have any questions about anything that happens in the classroom, from 1 to 3 pm is our designated Call-In Time, when the children are napping and your child’s teachers can speak with you as a team. Every three months (for infants) and six months (toddler through pre-k), the teachers will present you with a Developmental Report with detailed observation notes on all aspects of your child’s learning in the classroom. At that time, they will approach you to schedule a conference. We encourage you to take advantage of the opportunity to discuss your child’s learning. You may also at any time view the contents of your child’s Portfolio, which includes samples of their learning experiences in the classroom. Whenever possible, we prefer face-to-face conversations, as they enable real-time sharing of feedback and the give-and-take necessary to work together on common goals. Please be aware that drop-off and pick-up times can be complicated, when multiple children are transitioning into and out of the classroom at the same time. Brief conversations followed by a longer naptime follow-up phone conversation often work the best to ensure your concerns are addressed appropriately. We welcome your input and appreciate your participation in your child’s learning!